The power of the Galactic Empire reaches across the galaxy with countless squadrons of TIE fighters, massive Star Destroyers, legions of Stormtroopers, and the ultimate symbol of the Empire’s might: the Death Star. These countless expressions of Imperial power can daunt and dismay any rebel who takes up arms against the Empire, and for those who still fight back, you can bring down the Imperial fist with deadly firepower and wholesale destruction. 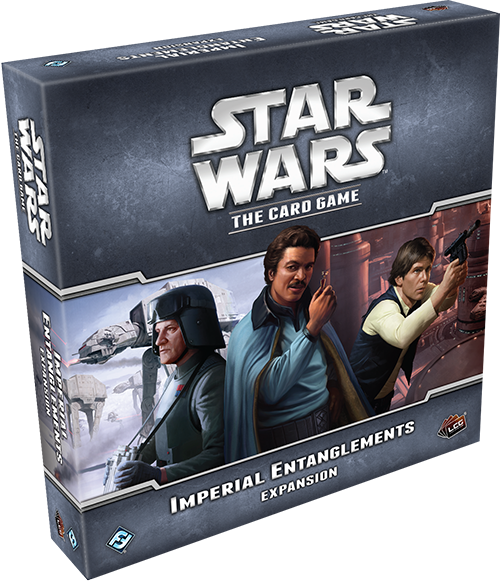 The Imperial Entanglements deluxe expansion brings the spotlight to the Imperial Navy and the Smugglers and Spies of Star Wars™: The Card Game. Today, we invite you to take command of the Imperial Navy with the Enforced Loyalty objective set! 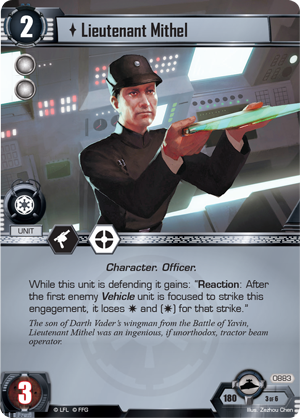 When you fight for the Imperial Navy in Star Wars: The Card Game, you are tasked with protecting and preserving the Empire. You are free to use any means and any measure of force to maintain order. When enemies oppose you, you have every right to destroy them with extreme prejudice. Now, Imperial Entanglements offers the tools you need, starting with Enforced Loyalty (Imperial Entanglements, 881). 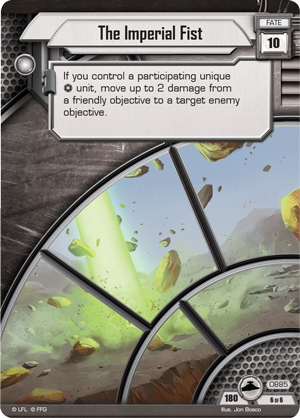 Many objectives in Star Wars: The Card Game offer powerful effects. Few can win the game singlehandedly. Enforced Loyalty is one of the latter, offering an effect that could win the game if left unchecked. This objective reads, “Reaction: After an opponent’s turn ends, if this objective is undamaged, deal 1 damage to each enemy objective. (Limit 1 per turn. )” Dealing mass damage across the board to the light side’s objectives is an extraordinarily potent effect. 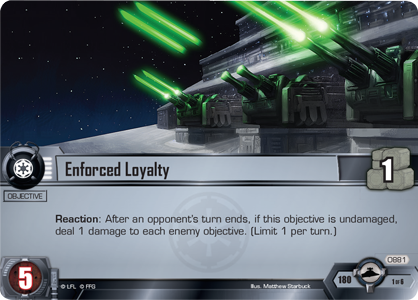 If you have Enforced Loyalty among your starting objectives, your opponent is forced to attack on the first turn or watch his objectives begin to disintegrate. If your opponent is playing a deck that prefers to wait and build for a few turns, Enforced Loyalty puts him on the clock and forces him to make his move sooner than he may like. With Enforced Loyalty on the board, your opponent will be eager to attack and neutralize its ability. Fortunately, this objective set offers a way to shut down enemy attackers with Lieutenant Mithel (Imperial Entanglements, 883). While Lieutenant Mithel is defending, the first enemy Vehicle unit to strike during the engagement loses some of its blast damage combat icons. Combined with Lieutenant Mithel’s tactics icon, you can easily shut down a light side attack. Of course, if you’re going to block attacks while making your own assault against enemy objectives, you’ll need a solid base of both cards and resources. 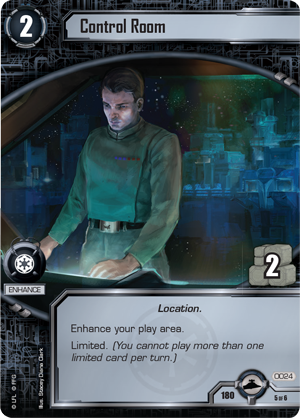 This objective set contains a copy of Control Room (Imperial Entanglements, 24) to help your resource curve, and you can draw more cards with the MSE-6 "Mouse" Droid (Imperial Entanglements, 884). 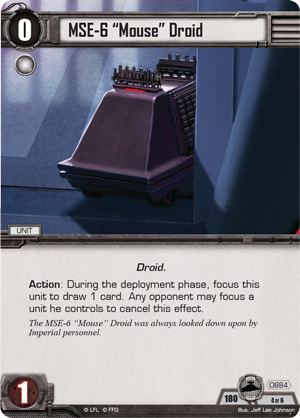 As an action during the deployment phase, you can focus this unit to draw a card. Your opponent can focus a unit he controls to cancel this effect, but if he focuses a unit, that only makes it easier for you to push your attacks through. 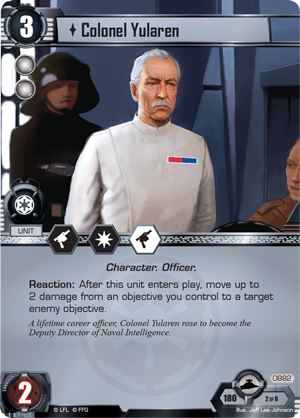 As the light side throws itself against your defenders, some damage will inevitably slip through to your objectives, but even that damage can become an asset with Colonel Yularen (Imperial Entanglements, 882), the Deputy Director of Naval Intelligence. After Colonel Yularen enters play, you can move up to two damage from an objective you control to a target enemy objective, possibly destroying an enemy objective singlehandedly. Even if you don’t destroy an enemy objective, Colonel Yularen is a dangerous defender, especially in combination with Imperial Entanglements (Imperial Entanglements, 886). 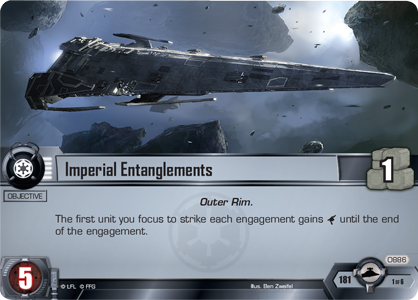 Finally, you can duplicate Colonel Yularen’s effect with a new fate card for the Imperial Navy – The Imperial Fist (Imperial Entanglements, 885). 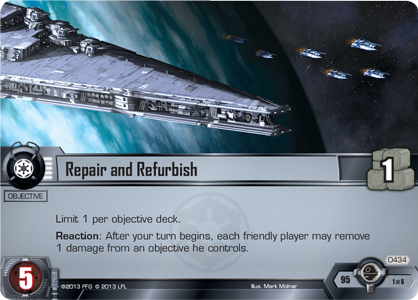 With this fate card, you can move two damage from a friendly objective to any enemy objective, as long as you have a participating unique Imperial Navy unit. 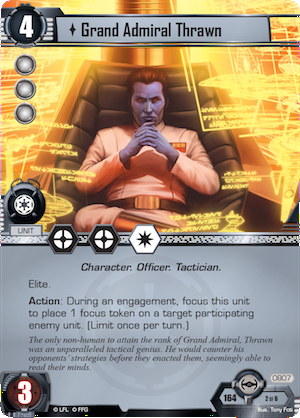 Between this fate card, Colonel Yularen, and the Enforced Loyalty objective, the amount of damage you can deal to your opponent’s objectives is staggering. 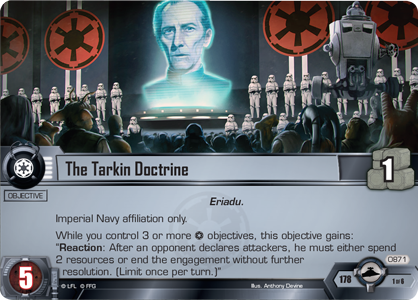 Even as you craft your offensive, you can keep control of the light side’s attacks with cards like The Tarkin Doctrine (Imperial Entanglements, 871) and Grand Admiral Thrawn (Chain of Command, 807) while you continue to heal your own objectives with Repair and Refurbish (Balance of the Force, 434). Between the dual elements of attack and control, the Imperial Navy can rise to command the galaxy! The Imperial Navy is in your hands. You determine which planets are worthy of mercy, and which must be purged for the safety of the Empire. Enforce the loyalty of the galaxy with the new Imperial Navy objective sets included in Imperial Entanglements. Pre-order your copy of this deluxe expansion for Star Wars: The Card Game at your local retailer today!